Section 1 has made us familiar with a number of cuts of beef and mutton, and with ways of cooking them. 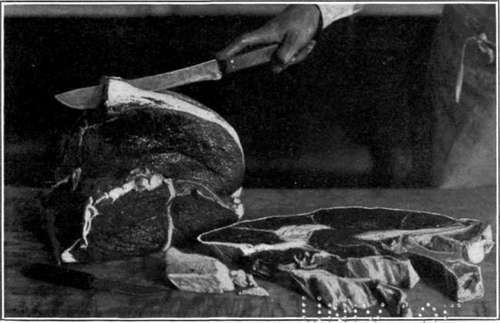 In the market we find all these cuts and many more; in order to select wisely from them the housekeeper must study them until she not only knows one kind of meat from another, and poor meat from good, but can readily recognize any cut, trimmed or untrimmed, and knows the market value and food value of each. How beef is cut up for sale.1 - Let us see first in what shape the butcher receives his stock-in-trade. The beef-creature is sent to market split into halves called "sides of beef." These the butcher divides, first into forequarter and hindquarter, then into pieces (see Fig. 11), and these into cuts to suit customers. The weight of a side of beef as it hangs by the hind leg throws the shoulder-bone forward and the thigh-bone backward, reversing the angles which, in the living animal, they make with the back-bone, and altering the position of the muscles attached to them. 1 Diagrams and descriptions in this text-book follow New York City customs. For other ways of cutting and of naming cuts see Farmers' Bulletin No. 84, Meats: Composition and Cooking. Fig. 11. 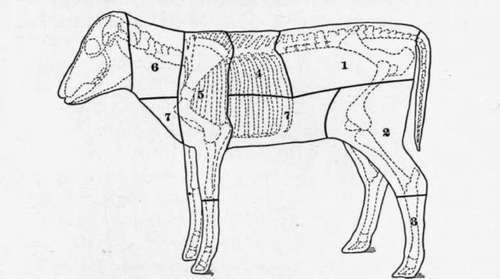 - Diagram showing cuts of beef. 1 and 2 = loin (1 = sirloin). Upon severing the forequarter from hindquarter just back of the ribs, we recognize on the latter the small end of the loin. The first few steaks cut here are short in the flank and have little tenderloin; they are called short, club, or Delmonico steaks. Porter-house cuts lie between these and the junction of the hip-bone with the spine, and the sirloin between this joint and the thigh-bone. In the hollow of the loin lie the kidneys, surrounded by hard fat, the suet. A solid chunk of flesh below the sirloin is known, queerly enough, as top sirloin; the round, of which top sirloin is really part, consists of the mass of flesh back of the hip-bone. A streak of gristle running down through this portion divides it into top and bottom round, properly inside and outside round, but called otherwise because the round is always laid on the block inner side up. (Plate IX.) The leg severed from the round at the lower end of the thigh-bone furnishes upper and lower shin. The rump, a wedge-shaped piece of coarse meat containing the lower vertebrae and the end of the hip-bone, comes out between the sirloin and round. 1 and 2. Rib chops, Frenched. 5 and 6. Rib chops. 3 and 4. Loin chops. 7. Blade shoulder chop. a b a, chuck; b, prime ribs. a b a, round of beef with slices of top round taken off. 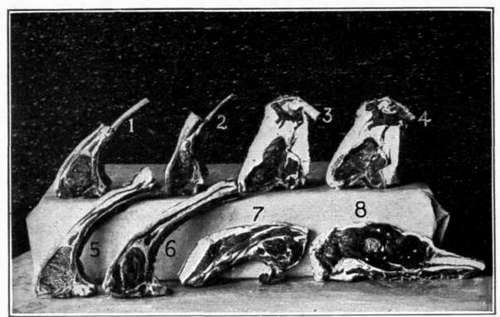 b, flat bone sirloin steak; urinmed; trimmings shown. The most notable feature of the forequarter is the chest with its arch of ribs, the first six of which, counting forward from the loin, are, both from quality and from position, termed prime ribs. Over the seven chuck ribs lies the shoulder-blade, which appears at the seventh rib as a streak of yellow gristle, and grows bonier and thicker from there forward. Across the ribs lies the cross-rib, a boneless piece of flesh, corresponding to the top sirloin in the hindquarter. The diaphragm inside the ribs forms the thin, coarse strip called skirt steak. The brisket, adjacent to chuck, neck, and fore leg, includes the breast-bone and part of the four forward ribs. The muscular wall covering and supporting the creature's belly is sold in sections (Fig. 11) as plate, navel, and flank. The floating ribs end in the navel. The flank includes the flank steak, a thin strip of lean embedded in fat. Mutton and lamb are usually quartered like beef. The loin is cut into chops. Hip chops, corresponding to sirloin steaks, are sold as loin chops, but are inferior, containing bone. The neck and shoulder sell cheap; the latter is cut for roasting with the fore leg, and if desired, with two or more ribs left on. Leg-of-mutton is the hind leg together with what corresponds to the round in beef. A sheep between two and three years old furnishes the best mutton. The age of mutton may be told by breaking the joint of the fore leg; the bones in a lamb are ridged; the less distinct these ridges, the older is the animal. By what signs would you know good beef? Good mutton? Hard mutton-fat purified makes tallow. Fig. 12. 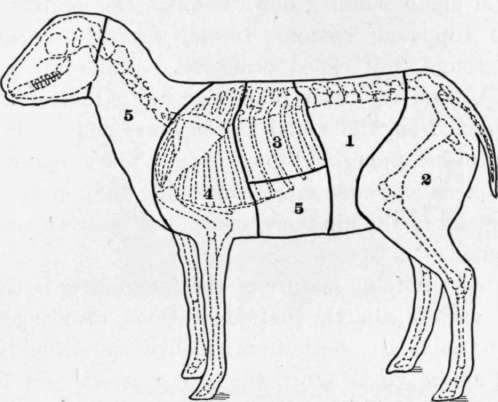 - Diagram showing cuts of lamb and mutton. Of the forequarter cuts of veal, the breast and shoulder furnish stew meat or second-quality roasting pieces, and the ribs are sold together as rack of veal, or separately as chops; as in beef, the hindquarter cuts are choicer. Roasting pieces or steaks and chops are cut from both loin and leg, slices from the leg being called cutlets. These contain a section of the round leg-bone. Breast and leg, tough in the full-grown animal, are tender in the calf. Fig. 13. 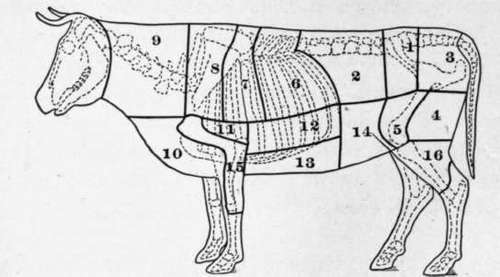 - Diagram showing cuts of veal. 2 = leg (cutlets, etc.). The best veal, that of a calf about two months old, is pale pink or flesh-colored, with clear white fat. White lean veal is unfit to eat. The ribs and loin of pork are sold for roasting, or as chops. Hams are the hind legs, salted and smoked; bacon, the flank similarly prepared. The thick layers of fat on the back and flank are commonly salted. The strips or "leaves" of kidney fat are "tried out," or rendered, and purified, to make leaf-lard; fat from other parts of the hog yields lard of poorer quality. Fat salt pork of good quality is white, or faintly tinged with pink, and has a thin rind. Fresh pork should be pale red and firm, with white fat. Good sausages are made of chopped and seasoned beef or pork, or both combined, packed in intestines. As it is easy to use all sorts of slaughter house scraps in them, as well as starch and other adulterants, it is important to buy only those made by a reliable manufacturer. Fig. 14. 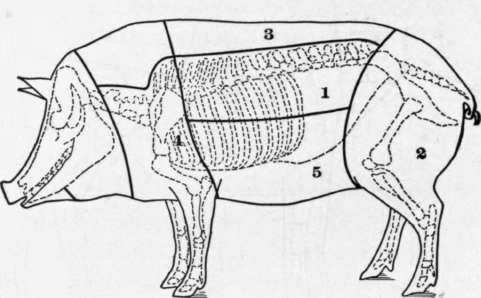 - Diagram showing cuts of pork. The tongue, liver, kidneys, heart, and some other organs of the ox and sheep are used for food. Tripe, the lining of a beefs stomach, is sold boiled. The brains, pancreas, and thymus gland of calves are considered dainties; the latter two are termed sweetbreads. Meat should come from healthy animals, should be handled in cleanly fashion, should not be allowed to spoil, and should not be kept from spoiling by harmful preservatives. The United States government inspects all meat to be sent out of the state in which it is killed. Meat killed and marketed in the same state is not always inspected. Look for the inspector's stamp on meat you buy. Inspected meat may cost more, but it is safer. Even inspection does not make pork safe to eat, unless it is cooked until it is white all through. Since less than one-fourth of the weight of a dressed beef consists of very tender meat, these tender portions are necessarily expensive. The less tender cuts, being more nutritious, are more economical; and, if properly cooked, are good eating, better, indeed, than higher-priced cuts badly cooked. The value of any cut depends not alone upon the quality of the edible portion, but also upon the proportion this bears to the refuse (bone, gristle, etc.). For example, prime ribs are even more expensive than they seem, because the purchaser pays for so much bone. Again, a cheap piece, containing much refuse, may be less economical than a higher-priced one, all of which is eatable. Recently killed meat is tender. It soon stiffens, owing to the clotting of certain proteins (p. 152). It becomes tender again after a time. Meat (and poultry) which is to be stored or to be shipped any distance must be kept very cold. Sometimes it is frozen. Cold storage is a convenience, but it tends to injure the flavor of both meat and poultry, and they spoil quickly when taken out. The lean of meat consists chiefly of protein and water. The more fat there is with a piece of meat, the greater its fuel value. If the fat is not eaten, this is lost. The extractives in meat cause its odor, and together with mineral salts, its taste. People like meat because of its flavor and stimulating properties. All kinds of meat are almost completely digestible, although not all equally easy of digestion. The lean of meat undergoes the first stage of its digestion in the stomach. The process is promoted by the extractives, which excite the secretion of gastric juice. The digestion of fat takes place mostly in the small intestine. Pork and veal are harder to digest than beef and mutton. Tender short-fibred meat passes through the gastric stage of digestion and leaves the stomach more rapidly than that which is coarse-grained and tough. Proper cooking may make tough meat almost equal to tender in ease of digestion, while careless cooking may dry and harden the choicest cuts. Put a few bits of raw lean meat into a test-tube, and cover them with water; add a little pepsin and a few drops of hydrochloric acid. (Pp. 86, 88 and footnote.) At end of one hour and a half, and at intervals afterward, examine the meat, noting its gradual solution. Sherman: Food products. Ch. 6. University of Illinois : Experiment station bulletin 158. Beef. U. S. Dept. of Agriculture : Farmers' bulletin 586. Mutton. Buchanan : Household bacteriology. P. 296, Ripening of meat. Barrows: Principles of cookery. Pp. 133-139 and 170-180, Use of left-overs. Stiles : Nutritional physiology. P. 151, Why gelatin is inferior as a tissue-builder. Jordan: Principles of human nutrition. P. 30, Commercial meat extracts.